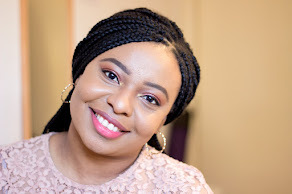 There is just something about bloggers and candles especially beauty bloggers. It makes your pictures look nicer especially if you have a blurry background but outside of all the blogging shenanigan, candles are beautiful and smell really nice. My love for candles has been heightened since I purchased my Desk. Although, I love them, I am not yet willing to splurge on it so I just purchased really nice, cheap and cheerful ones. I have always been intrigued with having candles around me because they just evoke a sense of calm and serenity that I can’t really explain. As much as I love candles, I cannot justify, especially at this point in my life, spending over £40 on a candle (Jo Malone and Diptique, I am looking at you!). 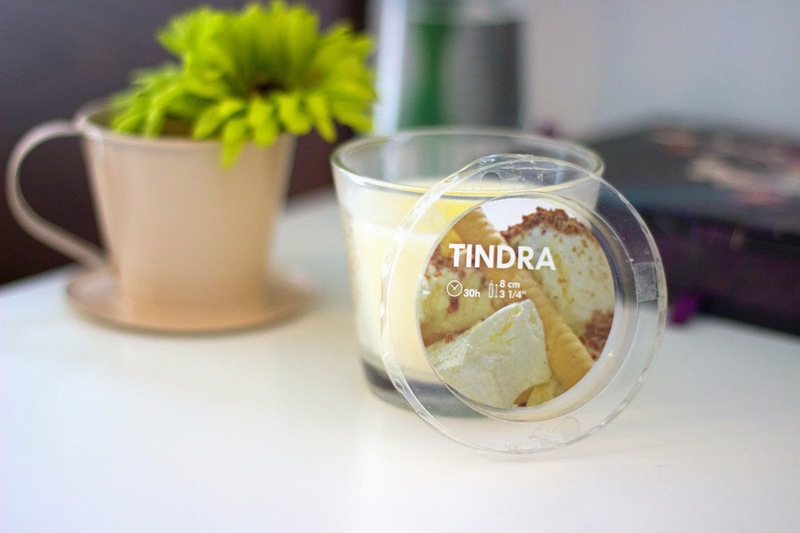 That’s the reason why I settled with affordable candles which you can find in many places. Now, I prefer scented candles and I am willing to pay the extra £1 or so for a scented version and all the candles in my collection are supposedly scented. Yes, supposedly because not all of them actually give off their “so called” scent but I can’t really complain because I got the "culprit" very cheap (99p from IKEA). Now this was a really tricky buy because I really like IKEA products but this candle did nothing for me to the exception of warming up my room which is of no use as I have a heater and it’s already Spring (allegedly). The packaging is a little deceptive as it has vanilla/ice cream on it which made me believe my room would have such a sweet smell. When you smell the candle itself, it actually smells really sweet but when it is burning, you get no smell whatsoever except a normal candle smell but why on earth am I moaning? It cost only 99p so it’s very forgivable. Nevertheless, it serves its purpose as props for blog photos and I would use the glass packaging for storage when it is finished. To me, these are the best affordable candles out there because they actually do what they say and you really don’t need an air freshener in your room after it has been burnt because the scent/fragrance actually lingers. I did not buy the larger sizes because I wanted to experiment with smaller ones first to decide what fragrance I preferred. I got the Sampler Votive Candles which cost only £1 in ASDA. 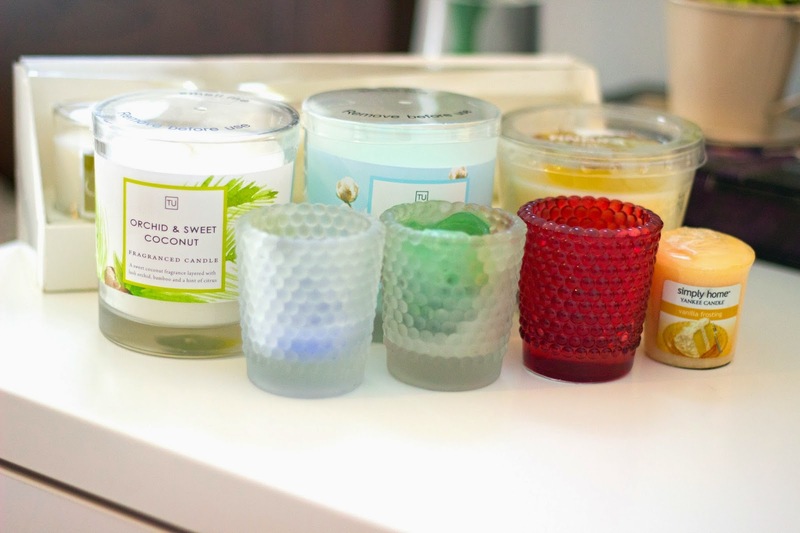 The fragrances I got include Clean Cotton, Coastal Waters and Simply Home. I also got the cute candle holders from ASDA for £1 as well which is a perfect fit for the Yankee Candles. 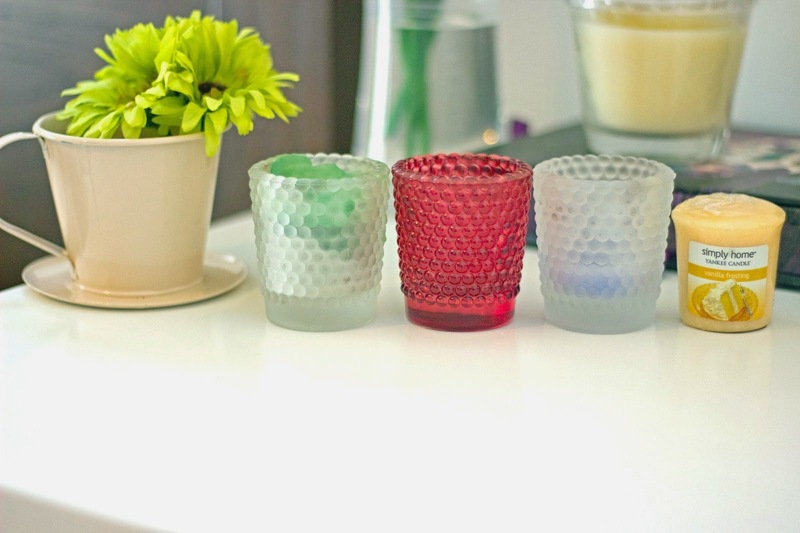 I will definitely splurge on the full sizes of Yankee candles because I believe they are worth it after testing out this little votive samples. I and my flat mate have been waiting for these candles to go on sales in Sainsbury’s because we love them but we have refused to splurge on it for its full price. One faithful day, our prayers were answered and this set of candles went on sales although it was just 1/3rd off but it was better than full price. The set contains Honey Papaya, Spring Meadow, Golden Fig and Wild Berry but Honey Papaya is my favourite and I think it lingers the longest after burning. The packaging looks so pretty and the dainty little candles look exquisite on my table but sadly, they do not give off their fragrance as well as the Yankee candles which is really sad as I had high hopes for it given the price. Don’t get me wrong, they do give off a nice fragrance but it is rather faint and if you want a stronger fragrance, you may have to light up at least 2 of these candles which is a sad waste!! However, they photograph beautifully and they actually burn really well. Some candles just burn so fast and it seems like you don’t get your money’s worth with their short lifespan but that’s not the case with this set. They are lovely and long lasting although they are just candles so they will eventually burn off and I will convert their glass packaging, as usual, to something useful. Last but not least are these ones also from Sainsubury’s. They went on sales shortly before Mother’s Day sales came on in full swing and I am pleased I grabbed me two of these. They cost £2.66 each which I think is a fair price for the quality. I can’t remember what their full price was; I think it may have been £5 but I am not quite sure. I chose the Orchid & Sweet Coconut and Wild Cotton fragrances because those were the ones that appealed to me the most. 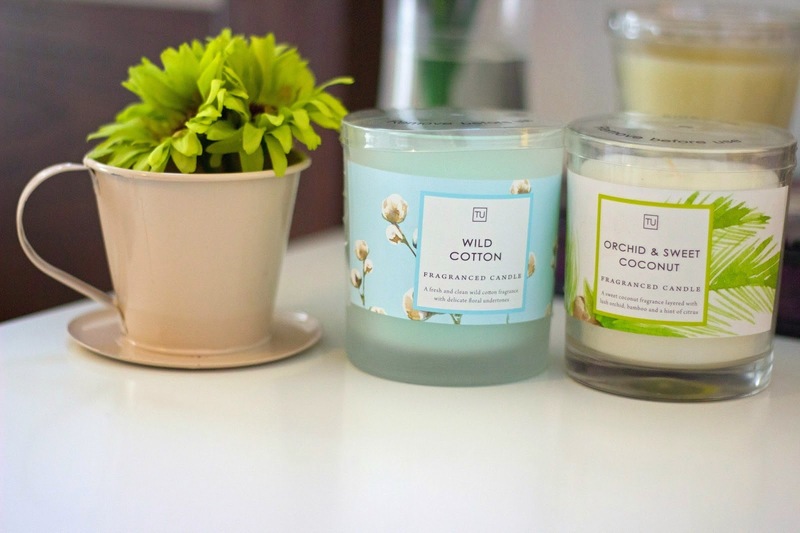 The Orchid and Sweet Coconut remind me of the beach and the Wild Cotton reminds me of a clean bed and laundry which I just love to have but hate to do the actual laundry L. I prefer this set of candles to the previous set because they are bigger, longer lasting and they leave a really nice fragrance that lingers in the room after burning it. That’s it folks. I love candles and ever since I got my table and organised my work space (I have a post on it here),I use different candles according to how I feel. I find that they just make my pictures look better especially as props when they are blurred out or even when they are in focus. 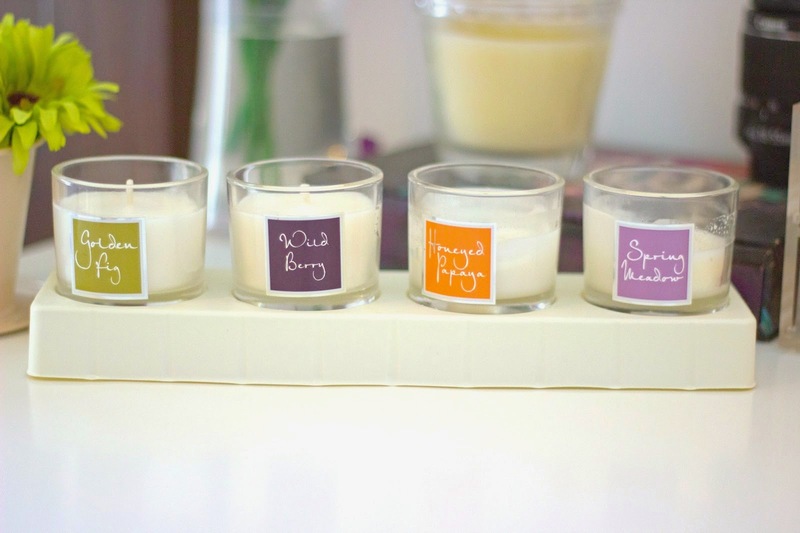 I love them all including the naughty “faux fragranced ones”. What’s your favourite candle?